Elon Musk is an INTJ. This is a four-letter code of the Myers-Brigg Type Indicator, one of the world’s most frequently used tools for mapping out personality profiles. Those letters stand for: Introversion (I), Intuition (N), Thinking (T) and Judgment (J). INTJs are also called Scientist, Analyst or Mastermind. We prefer using the latter term: Mastermind with a capital ‘M’. Because to INTJs, life is an abstract puzzle that requires solving. They are true Masterminds: thinkers with a great deal of imagination. They think independently. They’re curious, decisive and ambitious. But they are also closed off and introverted. Masterminds only sparingly put effort into social contacts. Due to their inherent thirst for knowledge, Masterminds are often called bookworms when they’re little. And while this is mostly not meant as a compliment, they will probably wholeheartedly agree. Because they themselves greatly enjoy their broad and in-depth knowledge. These Masterminds firmly believe that everything is possible. As long as you have sufficient knowledge and dedication. To them, most people are too lazy, short-sighted and egotistical to fully realise their potential. Those who cannot keep up with their thinking prowess and tempo or worse, don’t see the point, won’t be able to count on much sympathy or respect. Also, Masterminds are usually ardent gamers, who can be completely immersed in a game of World of Warcraft, FallOut or BioShock. That’s right, a few of Elon Musk’s favourite video games. MBTI is based on the work of Carl Jung and has four opposite dichotomies. The first is Extraversion (E) versus Introversion (I): do you obtain energy and information from your surroundings and other people or more from your own ideas and thoughts? The second dichotomy is Sensing (S) versus Intuition (N): are you primarily focused on concrete facts or the use of those facts and correlations between varying facts? The third dichotomy is Thinking (T) versus Feeling (F): do you make decisions based on logic and objective facts or do you let emotions be your main decisive factor? The fourth and final one is Judging (J) versus Perception (P): are you guided by lists and plans or do you take an improvisational take on things? Your final score after a list of questions consists of four letters that tell you a great deal about your character and personality. Masterminds exude self-confidence. Their sharp talent for observation, creativity and formidable logic makes them forceful personalities. They never take accepted reality for granted. Rules, limitations and traditions are unacceptable to this personality type. Masterminds work to create the world, as they envision it. While their ambitions and decisiveness can sometimes come across as impulsive to others, Masterminds always act as rationally as possible. However much they impassionedly work towards their end goal, they always keep a cool head while going about it. This mechanism is not only applied to work processes, but also to people. Typical human tendencies, such as informal conversations and a pleasant atmosphere, are of little meaning to Masterminds, who strive for truth, depth and perfection. They live their lives as if they’re on an enormous chessboard and constantly moving pieces. Masterminds are first and foremost nerds, who overthink everything and think up all kinds of things. They are furthermore visionary revolutionaries who chase after their dreams and ambitions. The emphasis on thinking and dreaming could make them very ineffectual people. But there is a third component that prevents this from happening: the urge to actually put into practice that which they’ve thought of and dreamed about. The Masterminds are thinkers, dreamers and doers all in one. An incredibly strong combination of a nerd, a visionary and an entrepreneur. Masterminds easily switch between small details and the bigger picture. Their knowledge is based on idiosyncratic and often original and abstract visions and thoughts, between which they often make surprising connections. It’s as if some graphics card in their brain allows them to think completely visually. On the other hand, they have a preference for tried principles and corroborated facts. Their way of thinking is evidence-based and not built upon intuitive presumptions. This makes Masterminds critical and to the point: they have an inclination to constantly check all information that reaches them. And the solution they come up with is always crystal clear. At least, in their eyes. For example, as a child, Musk thought up a solution to no longer be afraid of the dark. ‘Darkness is just the absence of light,’ said the young Musk, in which he described darkness as ‘the absence of photons in the visible wavelength—400 to 700 nanometers’. And who’s afraid of an absence of photon? 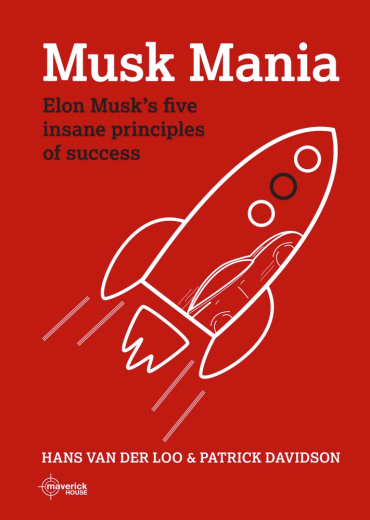 Extracted from Musk Mania: Elon Musk’s five insane principles of success by Patrick Davidson and Hans van der Loo published by Maverick House 2018.